Student leaders from Valencia College participated in the Florida Model Legislature held recently at Orange County’s Board of County Commissioners Chambers. The students spent the day learning about state politics through mock legislative sessions while Mayor Teresa Jacobs and members of her administration shared information about the intricacies of local government and public policy. 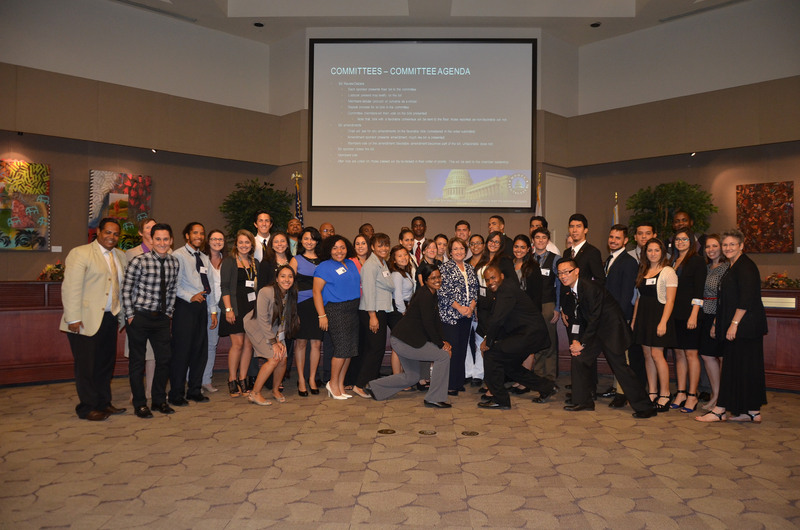 A group of about 50 students, college administrators and professors from Valencia College spent the day at the Chambers for the Model Legislature, which is a simulation of a Florida’s state legislature where student participants wrote, debated and voted on legislation while representing individuals in their legislative districts. Jason Dodge, coordinator of student development at Valencia College’s Lake Nona campus said leadership development is vital for all students. “Today’s Florida Model Legislature program was a great example of what we can accomplish through collaborative partnerships between the students and staff at Valencia and our County leadership,” Dodge said. “We would like to especially thank Mayor Jacobs for spending time with us today and Commissioner Jennifer Thompson’s office for assisting us in the planning of today’s event. The Model Legislature shifts civics teaching from a lecture-based approach to a dynamic, real world governmental experience allowing students to learn how a bill becomes a law on both federal and state levels. Sophomore JuliAnn Immordino, president of Valencia College’s Lake Nona Student Government Association (SGA), said she was excited about meeting Mayor Jacobs because she considers the Mayor a role model for young girls striving to find a leadership role in politics. Sophomore Celino Diaz, president of Valencia College’s Winter Park SGA, said meeting Mayor Jacobs and interacting with members of her staff encouraged the students participating in the Model Legislature to pursue their political aspirations. Valencia College is one the nation’s largest and most recognized community colleges with 70,000 students. In 2011, Valencia won the Aspen Prize for Community College Excellence based on the strength of its graduation and transfer rates, as well as the high job placement rates of its workforce training programs. The college offers a two-year Associate in Arts program that prepares students to transfer to an upper-division college or university; technical programs and continuing education courses that prepare students to meet the needs of business and industry, and several bachelor’s programs. Valencia operates six campuses and centers in Central Florida’s Orange and Osceola counties. A collection of photos from the Florida Model Legislature are available on Flickr for use by the media.